When you’re on vacation or out of the office for a day-long meeting, would you like to send an auto-reply to email messages that you receive? If your email provider uses cPanel then follow these instructions. Login to your email account using webmail. Typically, the web address you would use to do this will follow this pattern, http://www.yourcompany.com/webmail. 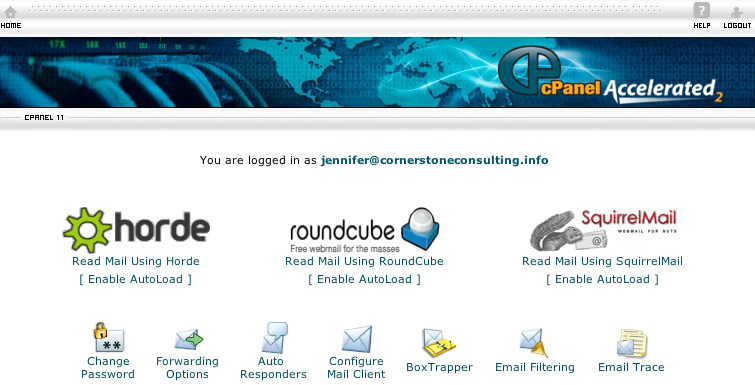 You’ll then see cPanel’s main screen, which will look similar to the photo below. Click the Auto Responders button near the bottom of the main screen. Fill in the form that appears, using the image above and the following details as a guide. I recommend leaving the Character Set on utf-8. Set the interval to 8 hours. This interval controls how often a sender will receive your auto-reply. You don’t want your colleagues to get an auto-reply every time they email you if they send you a handful of messages throughout the day. Enter your full name in the From field. Enter something like Auto Reply or Out of the Office in the Subject field. Leave the HTML box unchecked. Enter the message you’d like to auto-send as a reply to incoming emails. Use the Start and Stop options to set start and end dates and times. Click the Log Out button in the upper right corner. That’s it. If you configured it to start immediately, you can now send a test message from another email accounts to make sure it’s working. 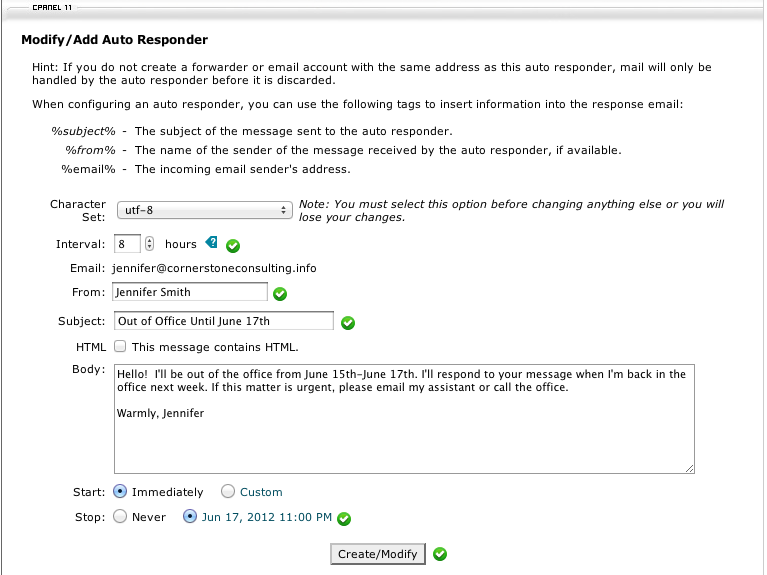 Read more about auto responder, auto-reply, cpanel, reply, setup, webmail.